From acclaimed Financial Times columnist and CNN analyst, a penetrating indictment of how today's biggest tech companies are hijacking our data, our livelihoods, and our minds. 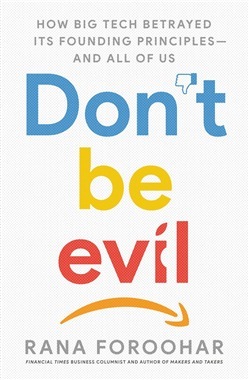 "Don't be evil" was enshrined as Google's corporate mantra back in its early days, when the company's cheerful logo still conveyed the idealistic spirit of the enterprise, and industry as a whole. Unfortunately, it's been quite a while since Google, or the majority of the Big Tech companies, lived up to this founding philosophy. And yet that quaint slogan--which has since been quietly but deliberately abandoned by Google leadership--reminds us that giants like Google, Facebook, Amazon, and Apple weren't always the cash-printing corporate leviathans they have become today. In fact, they were born out of a starry-eyed vision for a utopian future in which technology would inevitably make the world better, safer, and more prosperous, one in which the internet would be a grand connective force, uniting us in one global village while leveling the playing field for all. How long ago that all seems. Because in the span of the past two decades, writes FT columnist Rana Foroohar, Big Tech lost its way--and its soul. Through her skilled reporting and unparalleled access--won through nearly 30 years covering business and technology--Foroohar tells the story of how giddy idealism turned to greed, how a world where "information wants to be free" became one in which we are the product being monetized, how the geeks tinkering with motherboards in their basements grew to be arrogant billionaires monopolizing the lion's share of the economy, and how the "democratized" internet we were promised came threaten the very fabric of our democracy. Acquista Don't Be Evil in Epub: dopo aver letto l’ebook Don't Be Evil di Rana Foroohar ti invitiamo a lasciarci una Recensione qui sotto: sarà utile agli utenti che non abbiano ancora letto questo libro e che vogliano avere delle opinioni altrui. L’opinione su di un libro è molto soggettiva e per questo leggere eventuali recensioni negative non ci dovrà frenare dall’acquisto, anzi dovrà spingerci ad acquistare il libro in fretta per poter dire la nostra ed eventualmente smentire quanto commentato da altri, contribuendo ad arricchire più possibile i commenti e dare sempre più spunti di confronto al pubblico online.